His advance-folk might be prepping for Jerusalem in May and March'll see him head to Africa... but one place B16 seemingly won't be going anytime soon is Taiwan. The Holy See formally maintains its Chinese diplomatic presence in Taipei (albeit without a full-stop nuncio), but keen to maintain the Vatican's relations with the mainland (read: Beijing) on their gradually-improving path, the pontiff reportedly declined an invite to the island for its hierarchy's 150th anniversary next year. 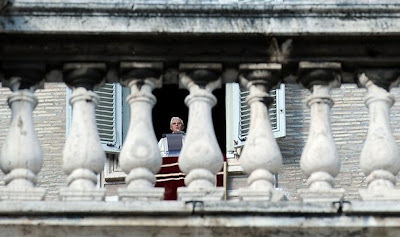 Receiving its bishops last week on their ad limina visit, Benedict pulled together five key themes in his closing address -- catechesis, the family, vocations, the rights of migrants and faithful citizenship. Priority must also be given to the thorough preparation of catechists. Once again, it is essential to take into consideration the array of settings in which they work and to furnish them with the necessary resources so that they may follow the example of Jesus in speaking the truth straightforwardly and in a way readily accessible to all (cf. Mk 4:11). With their active support, you will be able to draw up well-planned catechetical programmes that employ a progressive and gradual methodology, so that from year to year an ever-deepening encounter with the Triune God may be fostered among your people. Effective catechesis inevitably builds stronger families, which in turn give birth to new priestly vocations. Indeed, the family is that "domestic Church" where the Gospel of Jesus is first heard and the art of Christian living first practised (cf. Lumen Gentium, 11). The Church, at every level, must cherish and foster the gift of priesthood so that young men will generously respond to the Lord’s call to become labourers in the vineyard. Parents, pastors, teachers, parish leaders, and all the members of the Church must set before young people the radical decision to follow Christ, so that in finding him, they find themselves (cf. Sacramentum Caritatis, 25). The family, as you know, is that "first and vital cell": the prototype for every level of society (cf. Apostolicam Actuositatem, 11). Your recent Pastoral Letter Social Concern and Evangelization underscores the Church’s need to engage actively in the promotion of family life. Founded on an irrevocable covenant, the family leads people to discover goodness, beauty and truth, so that they may perceive their unique destiny and learn how to contribute to the building up of a civilization of love. Your deep concern for the good of families and society as a whole, my Brothers, moves you to assist couples in preserving the indissolubility of their marital promises. Never tire in promoting just civil legislation and policies that protect the sacredness of marriage. Safeguard this sacrament from all that can harm it, especially the deliberate taking of life in its most vulnerable stages. The Church’s solicitude for the weak similarly compels her to give special attention to migrants. In several recent pastoral letters, you have indicated the essential role of the parish in serving migrants and raising awareness of their needs. I am also pleased to note that the Church in Taiwan has been actively advocating laws and policies that protect the human rights of migrants. As you know, many of those who arrive on your shores not only share in the fullness of the Catholic communion, but also carry with them the unique cultural heritage of their respective places of origin. I encourage you to continue welcoming them with affection so that they may receive the assiduous pastoral care that will assure them of their belonging to the "family of the faith" (Gal 6:10). My dear Brother Bishops, by the providence of Almighty God, you have been appointed to keep watch over that family of faith. Your apostolic bond with the Successor of Peter entails a pastoral responsibility for the universal Church across the globe. This particularly means, in your case, a loving concern for Catholics on the mainland, whom I constantly hold in prayer. You and the Christian faithful in Taiwan are a living sign that, in a justly ordered society, one need not fear to be a faithful Catholic and a good citizen. I pray that as part of the great Chinese Catholic family, you will continue to be spiritually united with your brethren on the mainland. The same day as he met with the Taiwanese, the Pope also received the region's ranking churchman Cardinal Joseph Zen Ze-kiun, whose hawkish stance toward Beijing has led him to be dubbed the "Viagra of Hong Kong." Early this year, Benedict appointed a coadjutor to Zen perceived as more favorable to the mainland authorities. As official acknowledgment of this, Bishop John Tong Hon was invited to and attended August's Opening Ceremonies of the Summer Olympics in the Chinese capital -- a courtesy not extended to the Salesian cardinal, who turns 77 next month. Back on the island, in a November interview with a local outlet, the freshly-arrived charge d'affaires at the Taipei nunciature aired his forecast of "no change" in Sino-Vatican relations, at least over the short-term. While "the Pope hopes to see full and authentic religious freedom" on the mainland and "progress has been made" toward that end, Msgr Paul Russell said that "conditions do not yet correspond to what the Catholic church considers authentic religious freedom." A priest of Boston, Russell is the second US-born cleric to hold the Taipei post in recent years. For next year's 150th, the island's bishops have set an ambitious goal of baptizing 15,000 converts.